Google Analytics is the most widely used website statistics service. After you’ve properly installed it on your site, Google Analytics gathers data on the traffic of your site, allowing you to make intelligent marketing and business decisions. This analytics suite can track visitors from search engines, social networks, and direct visits. Google Analytics has a basic service, which is free, as well as a premium version. To learn more about Google Analytics or how to install it on your site, visit the Google Analytics Help Center. Real Time Suite: Gives data and shows what is going on within your site that instant. 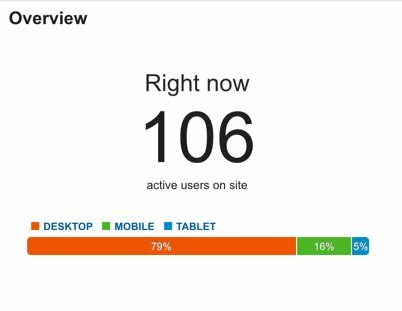 For instance, you can see how many visitors are on your site, what pages they are on, and what their geographical location is in real time. Audience Suite: This report centers on the people who are on your site and gives you insight into their characteristics, including their demographics, interests and behaviors, the electronic device or browser they use to access your site, and more. Acquisition Suite: Use this report to discover how your users arrived at your site. For instance, you learn what website users were on before they came to your site, or what keyword or keyword phrase they searched for to land on your website. Behavior Suite: The Behavior Reports focus on what people do when they arrive at your site. This report suite displays information like what pages users visit, how long they stay on those pages, and how many people exit that page. Conversions Suite: You run Conversion Reports to determine whether users are making purchases or completing the goals you’ve set up, such as subscribing to your newsletter or buying a product or service. A look at a Real Time report in Google Analytics. Each of these reporting suites contains multiple reports, and each of those reports can drill down into more and more detail. For example, you can view the Mobile Devices report in the Audience Report suite to see how visitor behavior differs when people visit your website from a desktop, mobile, and tablet. While you’re in this same report, Google Analytics allows you to change the parameters to view behavior by service provider (AT&T versus Verizon) and operating system (iOS versus Android). If you want to get more granular, drill down by clicking one of the operating systems to view visitor behavior by the version of the operating system.